The interior of the youngest neutron star in the Galaxy is being cooled by the emission of neutrinos, hinting at the processes that are at work inside these exotic objects, says Dr Wynn Ho of the University of Southampton, who is presenting his work today at the RAS’ National Astronomy Meeting in Glasgow. 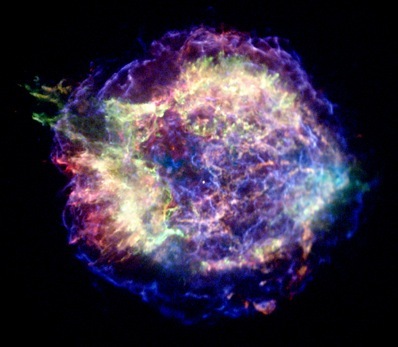 The Cassiopeia A supernova remnant, imaged by the Chandra X-ray Observatory. Somwhere deep within the filaments of the debris is the neutron star. Image: NASA/CXC/MIT/UMass Amherst/M D Stage et al. The neutron star in question is the Cassiopeia A supernova remnant, which is the debris of a massive star that exploded sometime in the latter part of the seventeenth century and left behind its crushed core, made almost entirely of neutron particles. Following the supernova the neutron star would have been billions of degrees hot, but has since cooled substantially to about two million degrees Celsius. Extremely hot objects emit X-rays and, for the past ten years, NASA’s Chandra X-ray Observatory has been taking snapshots of the neutron star every two years. Over this period Wynn Ho and Dr Craig Heinke of the University of Alberta in Canada observed the neutron star’s temperature drop by three percent. This temperature drop is evidence that nuclear reactions deep within the core of the neutron star are producing neutrinos that carry away thermal energy. Neutrinos are particles of barely any mass, and they very rarely interact with other matter, making their detection tricky – only ten neutrinos were detected from the far more powerful supernova 1987A. Consequently, we can only infer their presence via the cooling of the neutron star. At first the core, which is the hottest part of the neutron star, cools at a much faster rate than the outer layers because the hot conditions there produce more neutrinos. After a few hundred years the core gradually equalises in temperature with the outer layers, and the cooling becomes steady. However, although the neutron star should be around the age at which equilibrium is reached, the cooling is still observed to be a bit bumpy, implying that there are other forces at work other than neutrino emission.